A major challenge of the post-genomic era is to derive a complete map of all signaling networks in mammalian cells. One difficulty in mapping signaling pathways is determination of the substrates of each protein kinase [1,2]. Kinase substrates are difficult to identify chiefly because of the large size of the kinase superfamily (over 500 human kinases) and the large number of low-abundance substrates that kinases are predicted to phosphorylate. Current methods for identification of kinase substrates include: (1) searching protein sequence databases for known phosphorylation motifs , (2) screening for efficient substrates in expression libraries , and (3) detecting stable association between kinase and substrates by screening yeast two-hybrid libraries . Each of these methods has identified interesting candidate substrates, some of which have been validated using various biochemical tests. The vast majority of kinase substrates remain to be identified, however, because these methods do not take into account key aspects of kinase substrate recognition, such as subcellular localization, colocalization of kinase and substrate in large supramolecular protein complexes, and temporal activation/deactivation of kinase activity. In particular, tyrosine kinases do not possess high intrinsic specificity for short linear sequences flanking substrate phosphorylation sites ; this severely limits the application of sequence database searching for kinase substrates. Most biochemical and genetic screens require putative substrate proteins to be isolated from their cellular context. The physiological relevance of these in vitro substrates is questionable because it is known that the formation of signaling complexes (which colocalize kinases and their substrate proteins via many associated proteins) is critical to the observed signaling specificity in vivo . To address the challenge of identifying direct kinase substrates, our laboratory has developed a novel chemical approach to accelerate the process of kinase substrate identification (vide infra). A related, yet distinct hurdle in mapping kinase function is the generation of selective inhibitors for individual kinases. Small molecule inhibitors have advantages for deciphering the function of a kinase in that they can be used at any point in development (and thus do not suffer from poor temporal control over gene function as do knockout approaches), and they can be readily removed to restore kinase function, thereby providing rapid conditional on/off control . Furthermore, many protein kinases are considered potential drug targets for treatment of various human diseases . The key challenge in the design of kinase inhibitors for research or drug development has been to achieve target specificity. In order to be used as a therapeutic agent, a small molecule inhibitor should be very specific for its target kinase in order to minimize the off-target effects, which can be substantial in such a large and highly conserved family of enzymes. Despite the tremendous efforts spent in developing selective kinase inhibitors, only a few relatively specific inhibitors for protein kinases have been found to date [10-12]. One notable example is PD 98059, which specifically prevents the activation of MAPK/ERK kinase 1 (MEK1) by the upstream kinase MEKK due to the rare mode of action of the inhibitor . Clinically, Gleevec, an inhibitor that is known to inhibit BCR-ABL as well as at least three other kinases, was approved by the U.S. Food and Drug Administration (FDA) for the treatment of chronic myeloid leukemia disease. This is significant because it suggests that perfect specificity may not be essential for the development of kinase inhibitors as drugs [14,15]. However, truly mono-specific kinase inhibitors would greatly facilitate functional studies of individual protein kinases. To address this need, our lab has developed a chemical/ genetic approach, combining chemical synthesis with protein engineering, that circumvents the difficulties of both substrate identification and specific inhibitor design associated with this important gene family [16-18]. The approach we developed is to engineer one kinase in the cell to be structurally unique from all other kinases, yet functionally identical to its wild-type allele. By identifying a highly conserved active site residue that can be mutated to render it distinct from all other protein kinases in nature, the idea is to make specific binding easy to achieve. Of course, the mutation to the kinase must be silent in terms of phospho-acceptor specificity recognition, regulation of catalytic activity, etc. Figure 1 Sequence alignment of several engineered kinases in subdomains V and VII. The gatekeeper residue in each kinase and the second mutation (N-terminal to the DFG motif) in Cla4 and JNK are highlighted. then be exploited to distinguish the mutant from all wildtype kinases. For example, the engineered kinase can efficiently use ATP analogs with large substituents at the N6 position that are very poorly used (orthogonal ATP analogs) by wild-type kinases [16,19]. Importantly, the mutation has been shown not to alter the structure and specificity profile of the kinase  and is functionally silent in most kinases examined . Therefore, the engineered kinase together with [y-32P] orthogonal ATP analogs can be used to radiolabel the bona fide substrates of the target kinase in the background of any pool of proteins including whole cell lysates (Fig. 2). The strategy was first explored with the oncogenic tyro-sine kinase v-Src where it was shown that v-Src I338G (v-Src-asl) could use orthogonal ATP analogs efficiently, while wild-type v-Src cannot [16,19]. Next, a screen using NIH3T3 cell lysates containing v-Src-as1 and [y-32P]^6-benzyl ATP identified several novel candidate substrates of v-Src including Cofilin, Calumenin, and Dok-1 . Further studies suggested that v-Src phosphorylation sites on the scaffold protein Dok-1 are critical for its binding to negative regulators of the Src signaling pathway (RasGAP and Csk), which led to a model of the precise order of assembly of a retrograde signaling pathway in v-Src transformed cells . A wide variety of protein kinases (including both tyrosine and serine/threonine kinases) were later shown to be amenable to this approach, highlighting its generality [16,22-24]. Habelhah et al. used the approach to identify direct substrates of the stress-activated protein kinase, JNK. In this case, a second mutation in the active site, adjacent to the DFG motif (Fig. 1), was required for the engineered JNK (JNK-as3) to efficiently use A^-phenylethyl ATP. JNK-as3 was then used together with [y-32P]A6-phenylethyl ATP to identify heterogeneous nuclear ribonucleoprotein K, hnRNP-K, as a direct substrate of JNK. Interestingly, hnRNP-K was also found to be a substrate of another MAP kinase, ERK, and further study established the role of MAPK/ERK in phosphorylation-dependent cellular localization of hnRNP-K, which is required for its ability to silence mRNA translation . Several dozen other kinases are currently being investigated using the same approach for substrate identification, including CDK2  and Cdc28 (D. O. Morgan, unpublished results). Figure 2 Schematic diagram of two complementary methods to identify substrates of Src-as1. A [y-32P]-orthogonal ATP analog (A*TP) radiolabels only substrates of Src-as1 (represented by S1 and S7 proteins) as can be visualized by autoradiography. A specific inhibitor (Inhibitor) of Src-as1 can then be used to confirm the phosphorylation using autoradiography or western blot. c-Abl, CDK2, CAMKII) [17,18]. It was found that derivatives of PP1 could effectively inhibit the sensitized alleles of each of these kinases with high target selectivity. This chemical genetic approach provided inhibitors of the sensitized kinases with both high potency and unparalleled specificity, which enabled their use to reveal unexpected kinase-activity-dependent functions of various kinases, including v-Src , Cdc28 , Fus3 , Cla4 , Cbk1 , PKA (G. S. McKnight, unpublished results), v-erbB (W. Weiss, unpublished results), CAMKIIa (J. Z. Tsien, unpublished results), Ime2 (I. Herskowitz, unpublished results), and Apg1 (D. J. Klionsky, unpublished results). Bishop et al. used kinase sensitization to study the effects of target-specific inhibition of the Cdc28p kinase from Saccharomyces cerevisiae . Cdc28p is the major CDK in budding yeast and is essential for advancement through multiple stages of the cell cycle . 1-Naphthylmethyl-PP1 (1-NM-PP1) was found be a potent and specific inhibitor of Cdc28-as1 (Cdc28 F88G) from studies both in vitro and in vivo. Interestingly, a low concentration of 1-NM-PP1 (500 nM) caused cdc28-as1 cells to arrest at G2/M with a 2C DNA content and large hyperpolarized buds, while a higher concentration of 1-NM-PP1 (5 ^M) caused cdc28-as1 cells to arrest in Gj with a 1-C DNA content. This suggested that the G2/M transition is more sensitive to inhibition of Cdc28p activity than the Gj/S transition in the yeast cell cycle. This result was completely unexpected because previous studies showed that most temperature-sensitive cdc28 mutants arrested as unbudded cells in G1 at elevated temperatures, suggesting that the Gj/S transition is more sensitive to the inhibition of Cdc28p activity . The discrepancy between genetically (ts) and pharmacologically induced phenotypes can be explained by the possibility that Cdc28p has other critical cellular functions that are not directly attributable to its enzymatic activity. This demonstrates that chemical studies using small molecules complement traditional genetic studies in cell biology by revealing otherwise hidden functions of proteins. Weiss et al. utilized this kinase-sensitization strategy to study the physiological functions of Cla4p in budding yeast. Cla4p is an effector for Rho-family GTPase Cdc42p and is known to be involved in various actin-polarization-related processes . A genetic approach using temperature-sensitive mutants for the study of Cla4 is not ideal because actin-polarization-related processes are intrinsically temperature sensitive . Weiss et al. generated an inhibitor-sensitized Cla4 allele (Cla4-as3), which (similar to JNK) contained a second mutation (Fig. 1) necessary for high sensitivity to 1-NM-PP1. It was observed that the identity of the residue N-terminal to the DFG motif strongly affects sensitivity to inhibitor analogs: Thr or a larger residue at this position often abolishes binding of analogs, presumably due to a clash with the naphthyl moiety in 1-NM-PP1 . 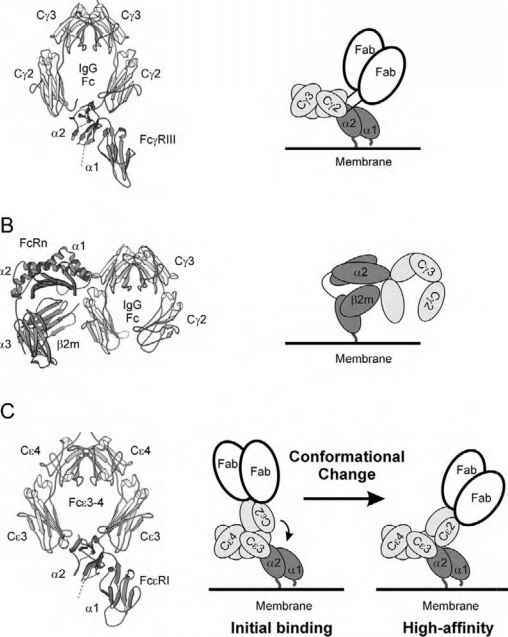 The inhibitor was then used to block Cla4-as3 activity at different stages of the cell cycle to reveal the roles of Cla4 during these different processes. Again, this revealed functions of the target kinase different from those revealed by genetic studies . Besides their use in cell biological studies, monospecific inhibitors can also be used for kinase substrate identification. 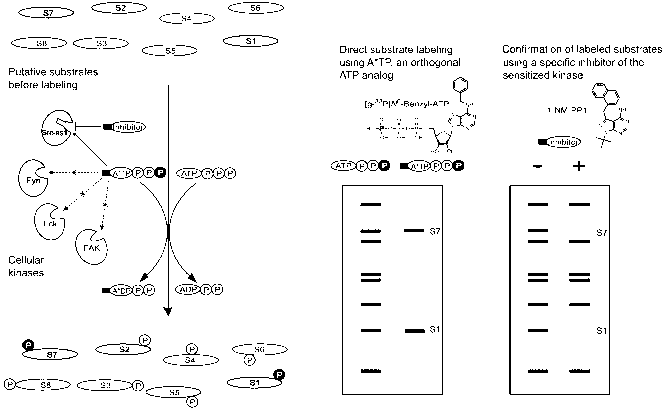 These inhibitors should significantly reduce the phosphory-lation of the substrate proteins of the target kinase in vivo, which could be utilized to confirm those substrates identified in direct in vitro labeling experiments using orthogonal ATP analogs (Fig. 2). Therefore, the same approach provides two complementary methods for kinase substrate identification and validation. It should be noted that a small number of kinases are not active when the gatekeeper residue is mutated to Gly or Ala. Such kinases display reduced stability or activity as purified proteins or in cellular assays (unpublished results). This problem can be addressed by introducing additional mutations to regain stability or activity, which was demonstrated by the work done on two isoforms of PKA, PKAa and PKAp (G. S. McKnight, unpublished results). It was shown that PKAa tolerated the modification at the gatekeeper residue, while modified PKAp showed a substantial loss of catalytic activity. This difference due to mutation of the gatekeeper residue was unexpected due to the high level of conservation between the two isoforms. Sequence alignment revealed that the differences between the two isoforms are all conservative except at position 47 (I47 in a and K47 in P). When Lys47 in PKAp was substituted with Ile, as in PKAa, kinase activity was increased to a level near that of wild-type, based on a reporter assay. Thus, second-site-suppressor mutations can be rationally found based solely on sequence information with homologous kinases that are known to tolerate mutation of the gatekeeper residue to Ala or Gly. Currently, we are in the process of identifying positions important for stability or activity of kinases aided by the data we have on all the kinases in which the gatekeeper residue has been modified. To summarize, a novel chemical genetic approach has been developed that possesses many advantages over purely genetic or chemical approaches for the study of protein kinase function. Most importantly, it is generalizable, with the potential of being applied to every protein kinase in the genome. We expect this method will be increasingly used in cell biology studies and will significantly accelerate the elucidation of various functions that kinases carry out in eukaryotic cells. We thank members of the Shokat lab, particularly P. J. Alaimo, for helpful advice and critical reading of the manuscript. This work was supported by NIH grants CA70331 and AI44009 and NSF grant MCB-9996303. 1. Shokat, K. M. (1995). Tyrosine kinases: modular signaling enzymes with tunable specificities. Chem. Biol. 2, 509-514. 2. Cohen, P. and Goedert, M. (1998). Engineering protein kinases with distinct nucleotide specificities and inhibitor sensitivities by mutation of a single amino acid. Chem. Biol. 5, R161-R164. 3. New, L., Jiang, Y., Zhao, M., Liu, K., Zhu, W., Flood, L. J., Kato, Y., Parry, G. C., and Han, J. (1998). PRAK, a novel protein kinase regulated by the p38 MAP kinase. EMBO J. 17, 3372-3384. 4. Fukunaga, R. and Hunter, T. (1997). MNK1, a new MAP kinase-activated protein kinase, isolated by a novel expression screening method for identifying protein kinase substrates. EMBO J. 16, 1921-1933. 5. Balendran, A., Casamayor, A., Deak, M., Paterson, A., Gaffney, P., Currie, R., Downes, C. P., and Alessi, D. R. (1999). PDK1 acquires PDK2 activity in the presence of a synthetic peptide derived from the carboxyl terminus of PRK2. Curr. Biol. 9, 393-404. 6. Songyang, Z., Blechner, S., Hoagland, N., Hoekstra, M. F., Piwnica-Worms, H., and Cantley, L. C. (1994). Use of an oriented peptide library to determine the optimal substrates of protein kinases. Curr. Biol. 4, 973-982. 7. Hunter, T. (2000). Signaling: 2000 and beyond. Cell 100, 113-127. 8. Shogren-Knaak, M. A., Alaimo, P. J., and Shokat, K. M. (2001). Recent advances in chemical approaches to the study of biological systems. Annu. Rev. Cell Dev. Biol. 17, 405-433. 9. Blume-Jensen, P. and Hunter, T. (2001). Oncogenic kinase signalling. Nature 411, 355-365. 10. Fry, D. W., Kraker, A. J., McMichael, A., Ambroso, L. A., Nelson, J. M., Leopold, W. R., Connors, R. W., and Bridges, A. J. (1994). A specific inhibitor of the epidermal growth factor receptor tyrosine kinase. Science 265, 1093-1095. 11. Gray, N. S., Wodicka, L., Thunnissen, A. M., Norman, T. C., Kwon, S., Espinoza, F. H., Morgan, D. O., Barnes, G., LeClerc, S., Meijer, L., Kim, S. H., Lockhart, D. J., and Schultz, P. G. (1998). Exploiting chemical libraries, structure, and genomics in the search for kinase inhibitors. Science 281, 533-538. 12. Davies, S. P., Reddy, H., Caivano, M., and Cohen, P. (2000). Specificity and mechanism of action of some commonly used protein kinase inhibitors. Biochem. J. 351, 95-105. 13. Alessi, D. R., Cuenda, A., Cohen, P., Dudley, D. T., and Saltiel, A. R. (1995). PD 098059 is a specific inhibitor of the activation of mitogen-activated protein kinase kinase in vitro and in vivo. J. Biol. Chem. 270, 27489-27494. 14. Zimmermann, J., Buchdunger, E., Mett, H., Meyer, T., and Lydon, N. B. (1997). Potent and selective inhibitors of the Abl-kinase: phenylamino-pyrimidine (PAP) derivatives. Bioorg. Med. Chem. Lett. 7, 187-192. 15. Gorre, M. E., Mohammed, M., Ellwood, K., Hsu, N., Paquette, R., Rao, P. N., and Sawyers, C. L. (2001). Clinical resistance to STI-571 cancer therapy caused by Bcr-Abl gene mutation or amplification. Science 293, 876-880. 16. Liu, Y., Shah, K., Yang, F., Witucki, L., and Shokat, K. M. (1998). Engineering Src family protein kinases with unnatural nucleotide specificity. Chem. Biol. 5, 91-101. 17. Bishop, A. C., Kung, C., Shah, K., Witucki, L., Shokat, K. M., and Liu, Y. (1999). Generation of monospecific nanomolar tyrosine kinase inhibitors via a chemical genetic approach. J. Am. Chem. Soc. 121 , 627-631. 18. Bishop, A. C., Ubersax, J. A., Petsch, D. T., Matheos, D. P., Gray, N. S., Blethrow, J., Shimizu, E., Tsien, J. 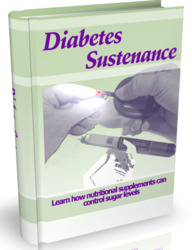 Z., Schultz, P. G., Rose, M. D., Wood, J. L., Morgan, D. O., and Shokat, K. M. (2000). A chemical switch for inhibitor-sensitive alleles of any protein kinase. Nature 407, 395-401. 19. Shah, K., Liu, Y., Deirmengian, C., and Shokat, K. M. (1997). Engineering unnatural nucleotide specificity for Rous sarcoma virus tyrosine kinase to uniquely label its direct substrates. Proc. Natl. Acad. Sci. USA 94, 3565-3570. 20. Witucki, L. A., Huang, X., Shah, K., Liu, Y., Kyin, S., Eck, M. J., and Shokat, K. M. (2002). Mutant tyrosine kinases with unnatural nucleotide specificity retain the structure and phospho-acceptor specificity of the wild-type enzyme. Chem. Biol. 9, 25-33. 21. Shah, K. and Shokat, K. M. (2002). A chemical genetic screen for direct v-Src substrates reveals ordered assembly of a retrograde signaling pathway. Chem. Biol. 9, 35-47. 22. Habelhah, H., Shah, K., Huang, L., Burlingame, A. L., Shokat, K. M., and Ronai, Z. (2001). Identification of new JNK substrate using ATP pocket mutant JNK and a corresponding ATP analogue. J. Biol. Chem. 276, 18090-18095. 23. Habelhah, H., Shah, K., Huang, L., Ostareck-Lederer, A., Burlingame, A. L., Shokat, K. M., Hentze, M. W., and Ronai, Z. (2001). ERK phosphorylation drives cytoplasmic accumulation of hnRNP-K and inhibition of mRNA translation. Nat. Cell Biol. 3, 325-330. 24. Polson, A. G., Huang, L., Lukac, D. M., Blethrow, J. D., Morgan, D. O., Burlingame, A. L., and Ganem, D. (2001). Kaposi's sarcoma-associated herpesvirus K-bZIP protein is phosphorylated by cyclin-dependent kinases. J. Virol. 75, 3175-3184. 25. Bishop, A. C., Shah, K., Liu, Y., Witucki, L., Kung, C., and Shokat, K. M. (1998). Design of allele-specific inhibitors to probe protein kinase signaling. Curr. Biol. 8, 257-266. 26. Schindler, T., Sicheri, F., Pico, A., Gazit, A., Levitzki, A., and Kuriyan, J. (1999). Crystal structure of Hck in complex with a Src family-selective tyrosine kinase inhibitor. Mol. Cell 3, 639-648. 27. Weiss, E. L., Bishop, A. C., Shokat, K. M., and Drubin, D. G. (2000). Chemical genetic analysis of the budding-yeast p21-activated kinase Cla4p. Nat. Cell Biol. 2, 677-685. 28. Colman-Lerner, A., Chin, T. E., and Brent, R. (2001). Yeast Cbkl and Mob2 activate daughter-specific genetic programs to induce asymmetric cell fates. Cell 107, 739-750. 29. Morgan, D. O. (1997). Cyclin-dependent kinases: engines, clocks, and microprocessors. Annu. Rev. Cell Dev. Biol. 13, 261-291. 30. Mendenhall, M. D. and Hodge, A. E. (1998). Regulation of Cdc28 cyclin-dependent protein kinase activity during the cell cycle of the yeast Saccharomyces cerevisiae. Microbiol. Mol. Biol. Rev. 62, 1191-1243. 31. Eby, J. J., Holly, S. P., van Drogen, F., Grishin, A. V., Peter, M., Drubin, D. G., and Blumer, K. J. (1998). Actin cytoskeleton organization regulated by the PAK family of protein kinases. Curr. Biol. 8, 967-970. 32. Delley, P. A. and Hall, M. N. (1999). Cell wall stress depolarizes cell growth via hyperactivation of RHO1. J. Cell Biol. 147, 163-174.